DNA Consultants is the only ancestry testing company with autosomal data on the Cherokee. Our two potential population matches, both of which are part of the beginner Cherokee DNA Test and full product called DNA Fingerprint Plus are: U.S. Cherokee Admixed (n=62) and U.S. Cherokee Admixed (n=92). The first was added in 2012 and the second in 2017. Here you will find links to other Cherokee DNA information together with in-house studies and publications. We have been studying Cherokee DNA for over 15 years and believe that we have both a unique collection and novel approach. Angela Watkins, project administrator. To send me an email use our comment form or write to aew(at)dnaconsultants.com. Update (May 25, 2018). Phase III mitochondrial testing to validate your Cherokee heritage has closed. This concludes this multi-phase project, which began in 2007. Phase I and II were published in Cherokee DNA Studies: Real People Who Proved the Geneticists Wrong in 2014. Phase III and cumulative data, including autosomal studies will be published in a second volume, subtitled More Real People Who Proved the Geneticists Wrong. Phase II mitochondrial testing closed on September 19, 2014. See the announcement. Results were released in a series of blog posts beginning with More Anomalous Mitochondrial DNA Lineages in the Cherokee – Part One. Phase I and II findings figured largely in the November 2014 monograph Cherokee DNA Studies: Real People Who Proved the Geneticists Wrong (DNA Consultants Series on Consumer Genetics, 1). Abstract. A purposive sample of individuals who took a mitochondrial DNA test to determine female lineage (n=67) was created from participants in DNA Consultants’ Cherokee DNA Project Phase II. Almost all beforehand claimed matrilineal descent from a Native American woman, usually believed to be Cherokee, and often named in genealogy research undertaken by the customer. The majority of subjects revealed “anomalous” haplotypes not previously classified as American Indian. Many matched others in Phase I. Several individuals overcame the barrier of a sealed adoption to find biological relationships, often to other participants. As in Phase I, a Middle Eastern type, haplogroup T, emerged as the most common lineage (19.4% in Phase II, 22.7% overall in the project), followed by H, U and J, all Eurasian types. Sub-Saharan African haplogroup L (9%) was prominent as a minor category. Old Europe haplogroups I, N, V and W occurred in small amounts and should be considered strikingly new, unreported signals of authentic Cherokee ancestry. Phase II, Autosomal Cherokee DNA. NEW! If your Cherokee ancestry does not lie in your direct female (mitochondrial line) it may be hidden elsewhere in your family tree. In December 2014, DNA Consultants inaugurated the first published forensic sample of Cherokee DNA on an autosomal basis, introducing the Cherokee DNA Test. A followup study to expand the original sample of 62 was announced in July 2016. The longtime administrator was Jakay Jarvis. Phase II is now closed. Cherokee Clans. An Informal History. By Donald N. Yates. E-book $1.95. Instant download. 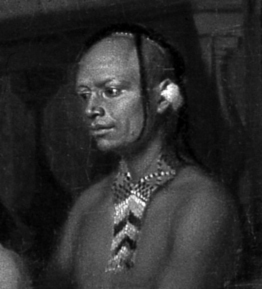 Notes on the seven Cherokee clans, their history, famous representatives and traditional strengths, as first published in Ancient American magazine. 24 pp. Anomalous Mitochondrial DNA Lineages in the Cherokee. Blog post dated August 31, 2009, that broke the news of Middle Eastern mitochondrial DNA in Cherokee descendants.